How to use the XML to JSON Conversion Tool at utilities-online.info? 1. 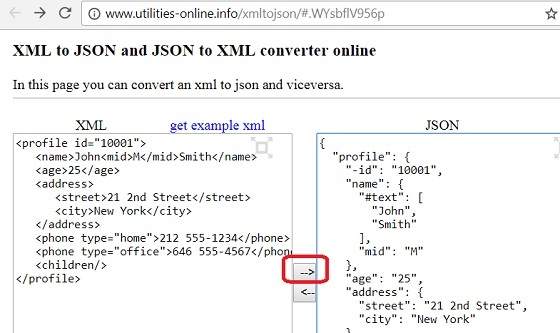 Go to the XML to JSON Conversion Tool page at utilities-online.info. An XML attribute is converted into a JSON name and value pair, with "-" added to the attribute name. Empty XML element is incorrectly converted to nothing. So the XML to JSON conversion tool at utilities-online.info is not good, because it truncates empty elements.